I have a picture of the library website on my phone from this morning with a date and time stamp showing the first two meetings were not posted. Today’s meeting is illegal and so is tomorrow’s. 48 hours people! Do I need to bring the Sheriff? This meeting will violate the Open Meetings Act if it is held. Mayor Renner: Is it your intention to hold another illegal meeting? 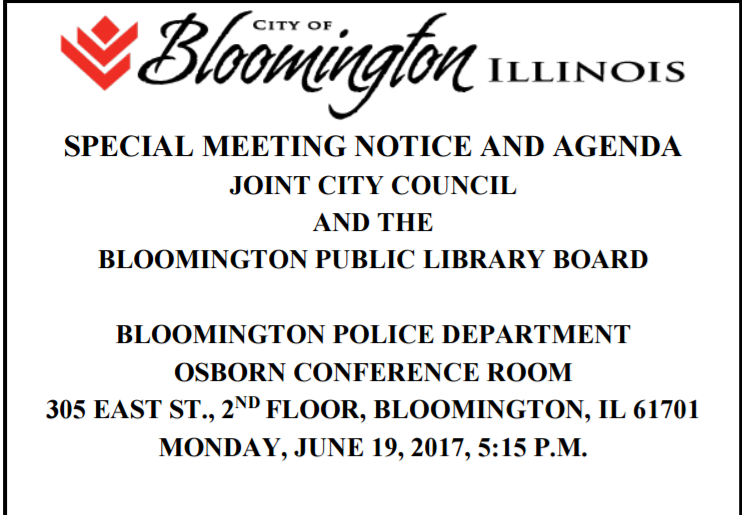 Posted in BloNo, Bloomington, Local, Renner.Tagged Bloomington Public Library, Open meetings Act. Went to the link to the Library website. There is a revised notice posted with the date of 6/16 @10 am. typed at the bottom. Since documents are routinely pre-dated one has to wonder if the post is legitimate. Duh, I have a pic from this morning. It isn’t cashed on my computer because I have never been to that page before. The meetings scheduled for tonight are messed up and have been. BLM social media announcement didn’t match the City’s official website post so the City had to revise it to the Council Chamber location. That change then required a revised posting for the Special Meeting of the Council and Library Board from both bodies. Somewhere along the way in this attempt to push an agenda through, the legality got lost. Am I understanding this correctly? On a side note, the bills report shows library employees receive tuition reimbursement as a perk. The report(s) include attendance at events. I might have said something that got them to change the location for the second meeting! There is no doubt in my mind that there is someone at the city whose job it is to read and notify city staff or the Mayor of the contents of the stories posted here as well as the responses. The meeting with BLM was changed shortly after your reporting. Coincidence? I think not! Could be little Miss Shayna is the source. Shayna is MIA last time I checked. She found out it isn’t good to go after people who can afford to take you out. Is ANYTHING in BloNo legit? Previous Post Stark County: She’s gone!